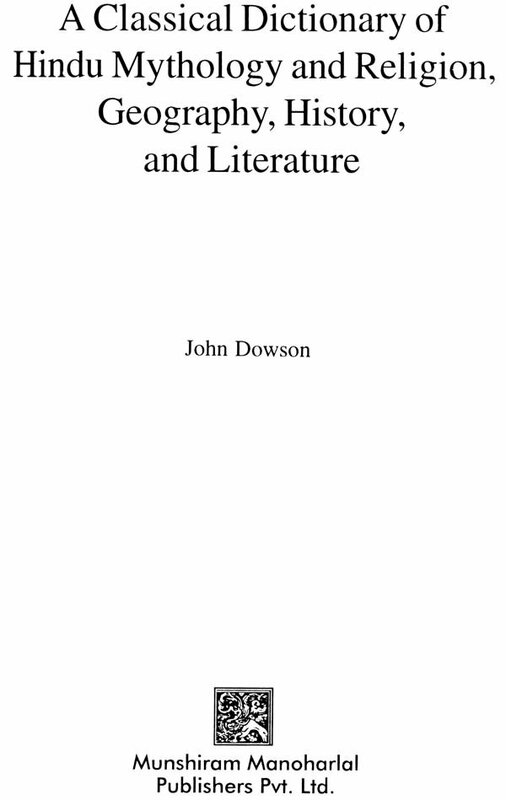 John Dowson's A Classical Dictionary of Hindu Mythology and Religion, Geography, History and Literature is a handy reference work prepared as an aid to the scholars and lay readers interested in these aspects of the past of India. 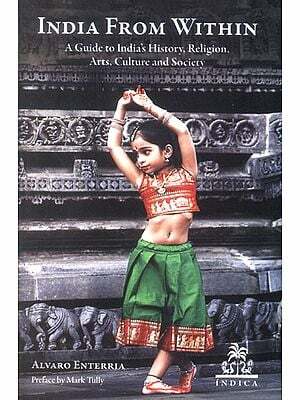 It contains information on a vast array of subjects, concepts, personages, names, events, etc., which frequently occur in the ancient Indian literature and religious works. For the uninitiated, the Dictionary is a useful guide for understanding the obscure and the unknown subjects. The present Dictionary is not merely an alphabetical list of terms and subjects; it contains, compact and condensed information culled together from various sources about each subject. The author has primarily depended upon authoritative translations and works of eminent scholars for the compilation of the Dictionary. Besides the literal meaning, the compiler has also given a full description of the subjects with necessary details. For those interested in delving deeper into the controversial subjects included in the Dictionary, references of learned articles and European works have also been supplied. A brief introduction of the subject outlining the history of the works alluded to in the Dictionary, a Sanskrit Index and a General Index add to the usefulness of the volume. IN this work an endeavour has been made to supply the long-felt want of a Hindu Classical Dictionary. The late Professor Wilson projected such a work, and forty year ago announced his intention of preparing one for the Oriental Translation Fund, but he never accomplished his design. This is not the first attempt to supply the void. Mr. Garrett, Director of Public Instruction in Mysore, published in India a few years ago a., Classical Dictionary of India," but it is of a very miscellaneous character, and embraces a good deal of matter relating to the manners and customs of the present time. It has not obtained favour in Europe, and it cannot be considered as any obstacle in the way of a more complete and systematic work. The main portion of this work consists of mythology but religion is bound up with mythology, and in many points the two are quite inseparable. Of history, in the true sense, Sanskrit possesses nothing, or next to nothing, but what little has been discovered here finds its place. The chief geographical names of the old writers also have received notice, and their localities and identifications are described so far as present knowledge extends. 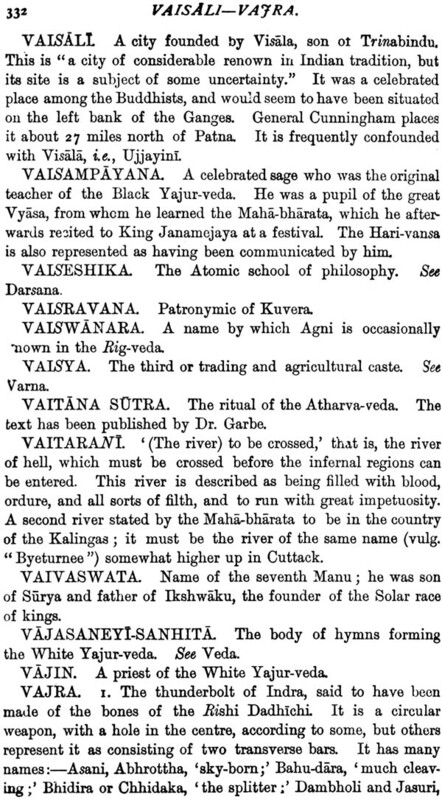 Lastly, short descriptions have been given of the most frequently mentioned Sanskrit books, but only of such books as are likely to be found named in the works of European writers. It must be understood from the first that this work is derived entirely from the publications of European scholars. I have not resorted to original Sanskrit authorities. My remaining span of life would at the best be quite insufficient for investigation of their manifold and lengthy volumes. 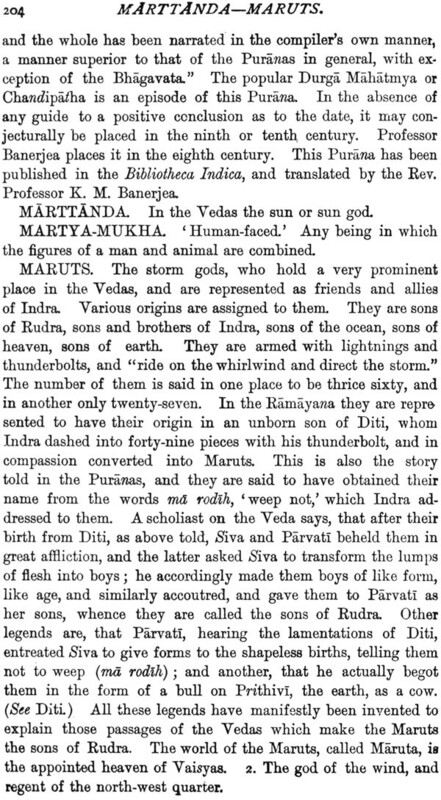 But I have gleaned from many European writers, and have sought to present a summary of the present condition of our knowledge of the religion and mythology of Ancient India. THE Aryan settlers on the banks of the Indus and in the land of the Five Rivers were possessors of a large number of hymns addressed to the elements and powers of nature. Some of these hymns they no doubt brought from their earlier homes in the West, but others were composed after they had reached the 'land of their adoption. These ancient hymns cover a long period, the length and the era of which can only be conjectured, but fifteen hundred years before Christ is about the mean of the various ages assigned to them. The hymns form what is called the Rig-veda Samhita, a collection which embraces all the extant compositions of the early Aryans. It is the Rig-veda which is of primary importance in Hindu religion and mythology; the other Vedas are later in date, and the second and third Vedas consist almost exclusively of hymns derived from the Rig, but specially arranged for religious purposes. The fourth or Atharva-veda borrows less from the Rig-veda, but is considerably later in date, and is of a different character. 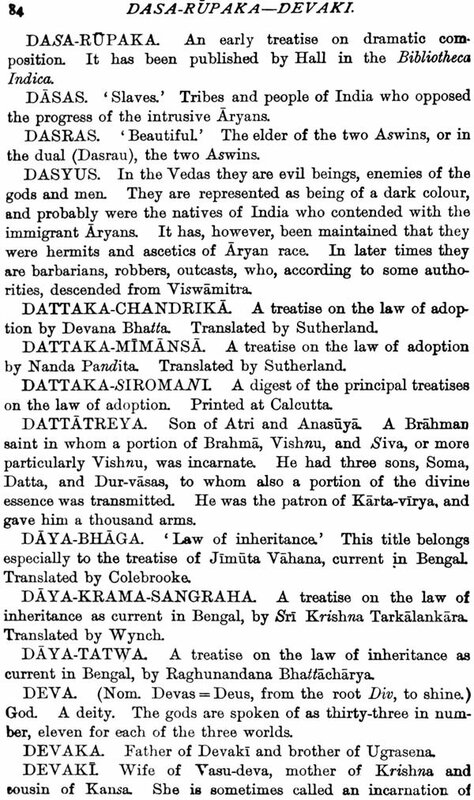 The Aryan hymns of the Veda embody the ideas of the Indian immigrants. These ideas were inherited from their forefathers. They were originally the property of the united progenitors of the Aryan races, and the offshoots of this great human stock have spread their primitive ideas over a large portion of the earth. In the Vedic hymns the ideas and myths appear in their simplest and freshest forms, directly connected with the sources from which they sprang by clear ties of language. Comparative philology and mythology go hand in hand; and as the language of the Vedas has proved the great critical instrument in the construction of the science of philology, so the simple myths of the Vedic hymns furnish many clues for unravelling the science of mythology. For where the etymology of a mythic name or term yields a distinct sense of its meaning, the origin of the myth is not far to seek. The language of the Vedas has in many instances supplied this clue, and led to a definite comprehension of what was previously hidden and obscure. 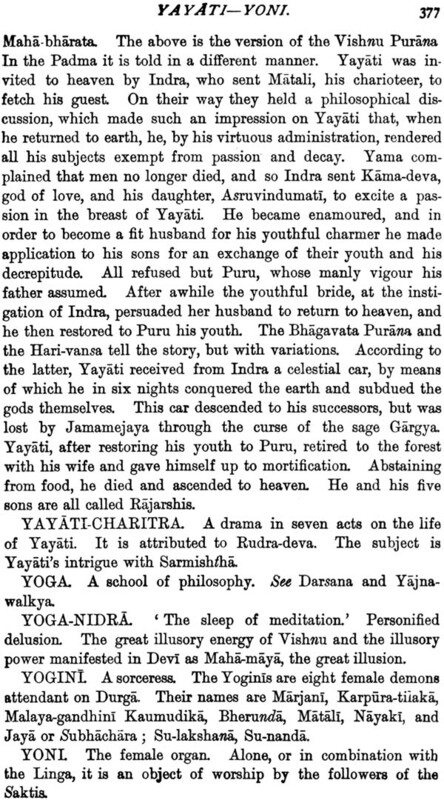 The Vedic hymns have preserved the myths in their primitive forms, and, says Max Muller, "Nowhere is the wide distance which separates the ancient poems of India from the most ancient literature of Greece more clearly felt than when we compare the growing myths of the Veda with the full-grown and decayed myths on which the poetry of Homer is founded. The Veda is the real Theogony of the Aryan races, while that of Hesiod is a distorted caricature of the original image." The Aryan settlers were a pastoral and agricultural people, and they were keenly alive to those influences which affected their prosperity and comfort. They knew the effects of heat and cold, rain and drought, upon their crops and herds, and they marked the influence of warmth and cold, sunshine and rain, wind and storm, upon their own personal comfort. They invested these benign and evil influences with a personality; and behind the fire, the sun, the cloud, and the other powers of nature, they saw beings who directed them in their beneficent and evil operations. To these imaginary beings they addressed their praises, and to them they put up their prayers for temporal blessings. They observed also the movements of the sun and moon, the constant succession of day and night, the intervening periods of morn and eve, and to these also they gave personalities, which they invested with poetical clothing and attributes. Thus observant of nature in its various changes and operations, alive to its influences upon themselves, and perceptive of its beauties, they formed for themselves deities in whose glory and honour they exerted their poetic faculty. They had no one god in particular, no superior deity guiding and controlling the rest, but they paid the tribute of their praise to the deity whose bounties they enjoyed, or whose favours they desired for bodily comfort. They lauded also in glowing language the personifications of those beauties of nature which filled their minds with delight and kindled the poetic fire. So each of the deities in turn received his need of praise, and each in his turn was the powerful god, able to accomplish the desires of his votary or to excite It feeling of awe or admiration. Thus there were many distinct deities, and each of them had some general distinctive powers and attributes; but their attributes and characters were frequently confounded, and there was a constant tendency to elevate now this one now that one to the supremacy, and to look upon him as the Great Power. In course of time a pre-eminence was given to a triad of deities, foreshadowing the Tri-murti or Trinity of later days. In this triad Agni (Fire) and Surya (the Sun) held a place, and the third place was assigned either to Vayu (the Wind) or to Indra (god of the sky). Towards the end of the Rig-veda Samhita, in the hymns of the latest date, the idea of one Supreme Being assumed a more definite shape, and the Hindu mind was perceiving, even if it had not distinctly realised, the great conception. As the Vedic hymns grew ancient, ritual developed and theological inquiry awoke. Then arose what is called the Brahmana portion of the Veda. This consists of a variety of com- positions, chiefly in prose, and attached to the different Mantras. Ritual and liturgy were the chief objects of these writings, but traditions were cited to enforce and illustrate, and speculation was set at work to explain, the allusions of the hymns. The simplicity of the Vedic myths gradually became obscured, the deities grew more personal, and speculations as to the origin of the world and of the human race invested them with new attributes. Later on, in the Aranyakas and Upanishads, which form part of the collective Brahmana, a further development took place, but principally in a philosophical direction.